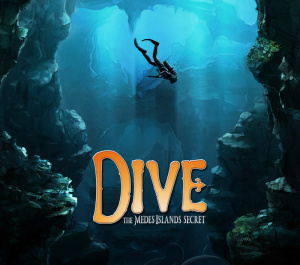 Dive: The Medes Island Secret marks the second WiiWare release from developer Cosmonaut and a far more ambitious project than its first release 5 Spots Party was. 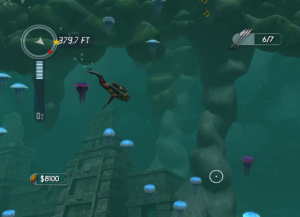 This time around, players will get the opportunity to explore vast underwater depths in search of hidden treasures using the unique motion controls of the Wii Remote. The gameplay premise of Dive basically revolves around the simple principle of exploration. 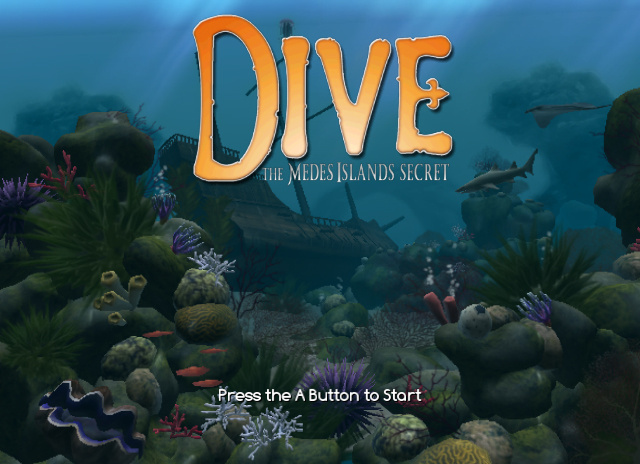 Each level will require you to take control of your diver whose ultimate goal is to locate the main treasure in order to move on to the next level. Of course you'll have to deal with the hazardous plant and marine life you'll encounter underwater, not to mention keep en eye on your ever-decreasing oxygen supply. You'll also have to make sure to keep a watchful eye on your radar as it will prove invaluable in your search for not only treasures, but also other useful items. 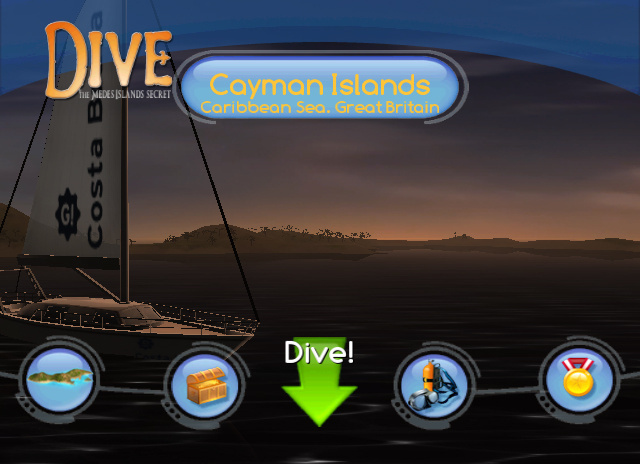 You control your diver using the Wii Remote. Your pointer will determine which direction your diver will swim and offers exactly the type of analogue precision you'll need in order to navigate some of the tricky spots underwater. Holding down the B button will cause your diver to kick his legs and swim at a steady pace, while double-tapping B gives a little speed boost, although this will use up more of his valuable oxygen supply. You'll also have access to a flashlight and spear gun, both of which will come in particularly handy during certain tricky parts of the game. Since you'll only have a limited number of spears with which to work, these should generally be used only when absolutely necessary. Earning money and upgrading your equipment also play a key role in your success throughout the game, so it's important to at least go after some of the smaller treasures in each level. 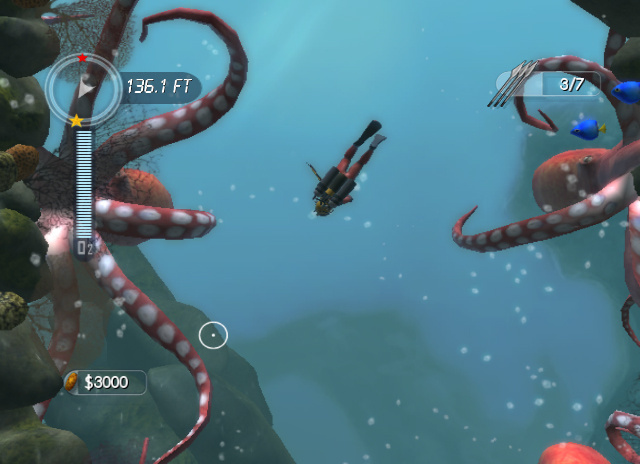 You'll soon find that your rather limited dive depth and oxygen supply won't cut it for locating some of the more well-hidden treasures, but by upgrading your dive suit, spear gun, oxygen tank and flashlight you'll soon be able to reach parts of levels that were previously inaccessible. Not only does this offer a lot more incentive to go after treasures the first time around, it also adds a nice layer of replay value to the mix as well. With three levels of difficulty to choose, gamers of any age and skill level should be able to fully enjoy the game. Of course it also doesn't hurt that the game's controls are extremely well-implemented and offer not only a very simple and intuitive control scheme, but some of the most responsive controls you're likely to see in a game of this type. You don't often see this level of play control polish in a WiiWare release, but it really pays off in the finished product. It is worth mentioning that we encountered a couple of gameplay glitches that kept us from acquiring a few of the smaller treasure chests, but it didn't affect our ability to complete the game's main quest and proved to be rather minor in the overall scheme of things. It is, however, something to keep in mind for those who like to collect everything during their gaming adventures. From a visual standpoint, there aren't many games with this level of graphical polish on the WiiWare service very often. The developers have put together a very beautiful and surprisingly realistic underwater world that really comes alive on screen. Not only is there an impressive level of detail contained within the surrounding areas, but the fluid animation found in both the marine and plant life is astounding. The same praise can also be heaped upon the audio presentation, as it's top notch as well. Every musical track in the game is extremely catchy and many are almost hypnotic in the way they seamlessly blend into the flowing underwater scenery. Even the other background sound effects perfectly convey a feeling of actually being underwater, especially for gamers fortunate enough to have a Dolby surround sound system in place. So many video games nowadays tend to put so much emphasis on action and intensity that it's refreshing to see a developer offer up a more relaxing experience. Taking the very basic principle of exploration, Dive carefully combines precise controls with some amazing underwater level designs to produce one of the most unique gaming experiences seen on the service to date. There are a few minor gameplay glitches along the way, but they do little to take away from what is an otherwise engaging and enjoyable underwater diving experience and one well worth the 1000 Wii Point asking price. Still doesn't interest me much. I'm good with Ecco and Aquaria. I was hoping to find a great Endless Ocean type game in this and great review by the way Corbie. I will def be snatching this gem up! This is the kind of game you can really sit down with and almost become lost in it. I'd look up and an hour had gone by in what felt like 10 minutes time. If you like exploration-type games, this one should keep you busy for awhile. Sounds like a good game, I was considering getting this... but being unable to get to collectables due to glitches is a huge turn-off for me. Heres hoping for an update (like was done with Gradius REbirth), if that happens I'll get it. @Mecoy: I got mine with wiispeak for monster hunter when MH was getting ready to come out, i believe, and I haven't played it yet either. In my opinion, exploration games are boring if they don't also have a decent amount of action. I don't play video games to relax. good to hear there's another quality wiiware release again finally! Its pretty much just become a graveyard for iphone/psp mini ports these days, unfortunately. So many cheaply produced, crappy forgettable puzzle games and thats it. We don't see games like Lost Winds, Cave Story or NyxQuest very often anymore, and yet here come Fuzzy Legends and Dive: Medes Islands in the same month? What a weird way to release things, Nintendo. Unfortunately, I got my Wii points saved up for Gaijinworks/Sunsoft's stuff. I gotta pick up both Aero games and especially Ufouria. THEN I will consider some more Wiiware stuff. Another game to add to my list. I won't be buying another Wiiware or DSiware game until I'm done with my current digital backlog. PSN is different because I might get a game if it's on sale for PS+ or regular PSN. Woot, just need a points card! Ooh, me was a-waitn' for this!!! so is there a free explroing mode that's like endless ocean and you can just kick back and relax? Also, how big are the enviorments? Gee now I'm suddenly interested in Endless ocean. I might see If I can find a used copy somewhere. I wasn't crazy about Ecco mainly because of the difficulty. I have a hard time getting into games that frustrate me. Especially if I don't have a nostalgic attachment to it. Dive looks like it's more forgiving and easy going. my kind of game. I've heard this game was great. The creator told me himself! Looks kinda like Endless Ocean, but more fun. Having played through the main story line of Endless Ocean 2 (also purchased for $30 w/ WiiSpeak in anticipation of Monster Hunter Tri) I recall I still have plenty of side missions left to complete, and a Lagiacrus to defeat, so I don't think I'll need to get this anytime soon. But it does look good and I'll probably get it someday. @Gaminguy: they're fairly large and nothing is forcing you to get the treasures so you could just nose about, though there isn't a formal "chill-out" mode. Definitely lacks the frustration factor of Ecco which really ruined that game for me. The glitches are disappointing, but at least they're not game-breaking unlike some we've seen in the past. 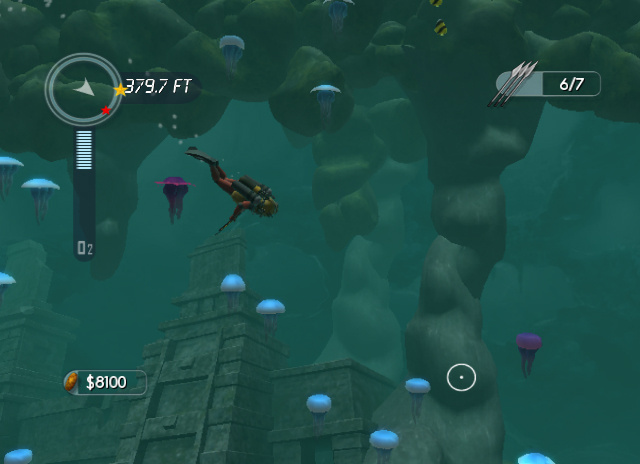 The glitches don't affect any of the game's treasures, relics, treasure chests or dolphin statues. They only affect a few of the rubies of which there are about 30-40 in each level. There are 413 things to collect and may be 3 or 4 which cannot (they seem to be surrounded by invisible barrier). I've found that if I restart the level I may be able to grab those things but I haven't verified that for all rubies. While this doesn't detract much from the overall experience, an update would be nice. Aquaria is a lot deeper and more involved, while Dive is more of a casual, laid-back experience. They don't really have much in common other than taking place under water. This sounds great. I'm a bit fussy about exploration style games like I am about strategy (I really like some, and not others) but I will be downloading this. Banging revw. Thanks! It is a fun game, lots of exploration, and certainly no where near as calm as endless ocean (there are hazardous animals everywhere, especially in later levels). Although besides the invisible barriers (which I have only encountered once), I have also had the game freeze outright on me twice and almost freeze another time. I had to force-reboot my wii in both instances. Also, as a nitpick, there are no hazardous plants in the game. When you mention plants, you are probably thinking of either the purple spiky things, which are a type of animal called sea urchins and are relatives of star fish (and pretty closely related to us), or the swaying purple/blue and red/yellow things anchored to the walls, which are a type of animal called sea anemones and are relatives of jellyfish (which are also in the game). Then there are octopi and a bunch of true fish. But there aren't any hazardous plants, or much in the way of plants at all (there is a little bit of seaweed, but most of the backdrop is coral, also a relative of jellyfish and also an animal). On the Aquaria parallel, even if I feel Aquaria is a much deeper story-driven game, I think they have a lot in common that just "taking place under water." The game is played on a 2D plane, like Ecco, and it involves a lot more backtracking through stages to unlock more goodies. This makes it more Metroid, which in turn draws another Aquaria correlation. The game may not be as deep, but it's a great attempt to do what Aquaria isn't doing yet on the Wii. I have Aquaria on my Mac, but this game offers a less alien environment that the average WiiWare store browser may enjoy. I say pick it up, because 2D underwater, story-driven games that involve exploration and pull it all in together this well aren't very common. A good way to spend 1000 points I say. Here's a video that gives a good taste of how the game plays. I got this game a few days ago and completed it today. Bugs are still in there. The most major one being the invisible wall bug that prevents gamers from getting 1 relic in Stage 6 and 2 relics in Stage 10. You can only get 352/355 relics (which makes a total of 85850$). This also prevents you from getting all achievements (You cannot get the very last one).